Every now and again a web based service comes along that takes our breath away, Bjørn Sandvik’s Thematic Mapping Engine is one of those services. Bjorn is a project manager at United Nations Association (UNA) of Norway who is currently on study leave to undertaking a master’s in Geography Information Science (GIS) at University of Edinburgh. 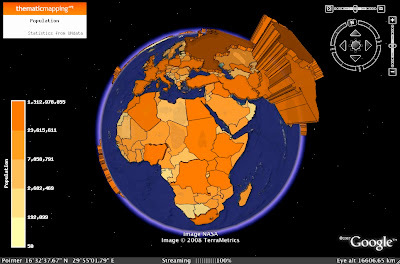 His Thematic Mapping Engine enables you to visualise global statistics on Google Earth in a way that only a few years ago would of been a showstopper using high end tools such as ESRI’s ArcGlobe. Its is quick easy with a colour scale that fits the mapping well, our movie below illustrates Global Population in 2005. It is simple to use – go the the main page of the Thematic Engine and select a required indicator – we picked Population. You can then choose your technique of mapping – we chose Prism – and date etc. Its self explanatory with a KML provided to open in Google Earth. For anyone interesting in mapping the Thematic Mapping Engine is well worth a look. Yes this is a cool tool – and somewhere at Bjørn’s blog he also has promised in near future to release the tool as open source. So for example you can for a local country and if you have the municipalities(zip codes etc) borders then you can import data to compare each municipalities etc. Looking forward to see Bjørn’s releasing it.